Trade Deal? What is it? People including politicians who should (or do) know better, often talk glibly of ‘trade deals’. According to Brexit supporters, once we are out of the EU we will be free to sign dozens of trade deals, with countries like US, Canada, Japan, India, Australia….. Trade will boom! Perhaps 9 of 10 of these people don’t know what they are talking about. They don’t know the difference between a trade deal, an FTA, and a bent banana. Do you? Firstly, what is a “Trade Deal”? It is no more than an agreement to buy or sell stuff. Usually a fixed amount of stuff. Northland will sell £1bn of arms to Southland, and will buy £1bn of oil from Southland. Or Southland will just pay in hard cash at the price agreed. When the stuff is imported into Northland, there may be customs charges due. Since Northland is a member of a trading bloc – the EU – the stuff will be charged customs duty at the rate set by the EU for any such imports. Those are Customs Tariffs. The same goes for exports, in reverse. The amount of imports may also be limited by quotas. The tariffs and quotas for imports and exports to and from a particular country might be determined by default, under the rather complex WTO rules, or might be set down in an Agreement between the EU and each country or trading bloc. (Phew, that makes life simpler.) Many countries have signed agreements with the EU, allowing them to benefit from tariffs lower than those of the WTO, and from agreed quotas. It is good for both sides. It allows business to trade with a degree of certainty, lowers prices, and makes trade more fluid. A win-win for all. The UK, being a member of the EU, lets the EU determine the tariffs and quotas for imports and exports to and from the bloc. Which means that firstly, the UK doesn’t have to negotiate all that nonsense with every country in the world that it wants to trade with (it can take years) and secondly, the UK benefits from the bargaining power of the EU which can secure more favourable export tariffs. Does that sound like a good idea? These eliminate customs duties in trade within the customs union. There are no tariffs on imports and exports between member states. They establish a joint customs tariff for foreign imports and exports. This is the agreement between all EU member states. Free Trade Agreements, or Association Agreements, Stabilisation Agreements, & Economic Partnership Agreements, Mixed Agreements…. These reduce or remove customs tariffs in bilateral trade. The EU has negotiated a number of such agreements and is in the process of agreeing many more. Each one is different They have been doing it for more than 50 years and are good at it. The UK hasn’t done it for over 40 years so don’t have much skill in the field. These provide a general framework for bilateral economic relations, but leave customs tariffs as they are. Most African, Caribbean and Pacific (ACP) countries implement or have signed Economic Partnership Agreements with the EU. The EU has also launched a series of other trade agreements with other developing countries in Asia, Latin America, Europe's Eastern neighbourhood and the Southern Mediterranean. The agreements with Canada and Japan are agreed in principle. There are close to 30 negotiations ongoing including with the US, Australia, New Zealand, ASEAN, Mercosur and the EU-China investment agreement. So – can the UK conclude Trade Deals while being a member of the EU? Yes. It can and it does. Although it has to be pointed out that other countries often do it better. For example Germany (another member of the EU) exports six times as much to China as the UK does. The EU does not yet have a FTA with China; it is still being negotiated. All that happens for the time being is that the imports and exports are charged customs duty. 10% on the cost of a Mercedes doesn’t seem to deter Chinese buyers. 5% on the cost of amazingly cheap jogging shoes doesn’t seem to deter European shoppers. And the Single Market? This is a unique EU invention. In addition to the customs union, the Single Market guarantees the free movement of goods, services, capital and labour within the Single Market area. A truly free trading zone. So - what’s the problem? Well, the problem is that politicians talk about “Trade Deals” as if they will suddenly cause milk and honey to flow throughout Britain. “We will be free...if we leave”. Well, what the UK will be free to do in addition to what it is already free to do, is to negotiate Free Trade Agreements - tariffs and quotas - with other countries or trading blocs. Such as those Association Agreements, Stabilisation Agreements, or Economic Partnership Agreements that the EU have been developing for years. Sounds complicated? It is. Typically it can take 5 to 10 years to conclude an Agreement. And then, practically all that the Agreement will achieve will be to take imports and exports off the complicated WTO tariffs and onto whatever tariffs are agreed between Northland and Southland in the agreement. But – a big but – an Agreement it will not automatically increase exports. It will make the exports a bit cheaper in the receiving country, but those buyers must actually want to buy the stuff. If Citroen make a better family car than… err… sorry I can’t think of a 100% UK owned car manufacturer except Morgan… so let’s call it Britmobile UK, the small reduction in price of Britmobiles in Southland will make some difference in sales but it won’t necessarily be a tsunami. What will make a difference is the quality of design and build, and improved efficiency of production which can bring down costs significantly. Sadly Britain is one of the least efficient economies in Europe. (Darn, can’t blame that on the EU.) Even ‘switching onto WTO rules” is an incredibly complex operation, which has to be undertaken in three year cycles; the current third year is 2018, (too late now) the next opportunity will only be in 2021. Yet the Brexit supporters claim it would be so simple… They have no clue. And how much “trade” is there to be had? Trade is not what pays our bills in the UK. It is Exports. So let’s look at the Exports picture. 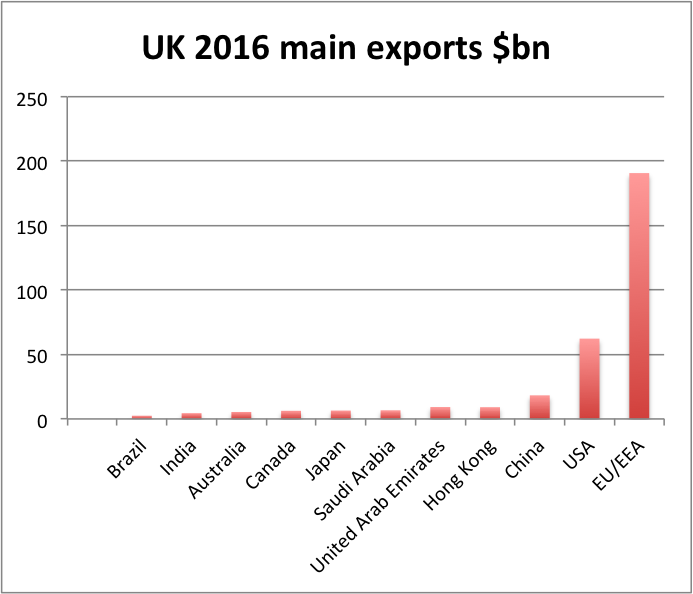 These are the main UK exports of goods in 2016. Do you see the difficulty ahead if we are out of the EU? A lot of work ahead to turbocharge sales to Australia! Britain is however very efficient in services, especially financial services. We are very good at it. It accounts for 80% of our GDP and is the major British export - around 30% of total export earnings. But a lot of that business derives from being positioned within the EU. If we are out, nobody knows yet how that business will be affected. It might be ok, I hope so. The negotiations between the UK and EU on services, as with trade negotiations, will be horrendously complex. But that’s for another time and place; the subject of this article is Trade Deals. I hope it has been helpful. * © Copyright 2018, Action for Europe and fearofmice.